Spring is supposed to be a time of renewal, of rebirth, isn’t it? And yet this spring I’ve been feeling that I’m stuck in a rut. Not a big rut. Not a huge car-swallowing pothole that I’ll never climb out of … bit of Canadian springtime imagery there. Just a certain sense of ennui, of style fatigue. And a vague feeling that everything I wear is a bit samey. Repetitive. Unadventurous. I think it’s time to move on… style wise. So in my spring shopping research I looked for ideas that might change up my style. Maybe move away from the narrow silhouette I’ve been clinging to, away from slim pants with a long slim top or blazer. I mean if my research is correct, this is the year to go big. And so I thought that wide-legged pants might be in order. Okay, that didn’t work out, as you’ll know from my last fashion post. Bu-ut a longer skirt might create the same effect. I almost always opt for a knee length skirt or dress. Since I despise maxi skirts… that meant midi length. And when I visited Liz at Nordstrom last week I did indeed come home with a black and white, striped midi-skirt from A.L.C. 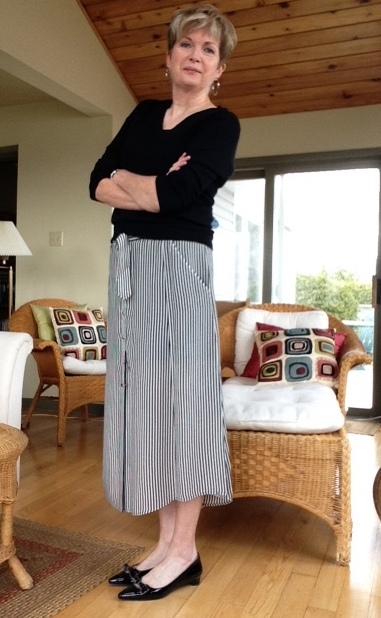 So now the problem becomes … what the heck am I going to do with this new longer, fuller skirt? How can I style it so that it doesn’t do exactly what the wide-leg pants did? Namely cover up my assets, and highlight the bits I’d rather hide. How can I make this skirt look modern, not matronly? And since I don’t have the trim waist that I had way back when, I’ll be aiming for something somewhere in between this, which is too “old me”… too dressy, too work-ey. And this… which is too funky, and too… just plain weird. I tried to find inspiration on Pinterest and created a board called Styling Spring 17. Then I moved on to my old standby Net-a-porter.com. And I found these three outfits. With skirts that were similar in length and shape to mine. I like that they’re paired with casual sweaters, and sneakers. I can do this kind of look. I think. I found these two outfits on Matches Fashion.com. My skirt is black and white, and has a curved hem like the one on the right. 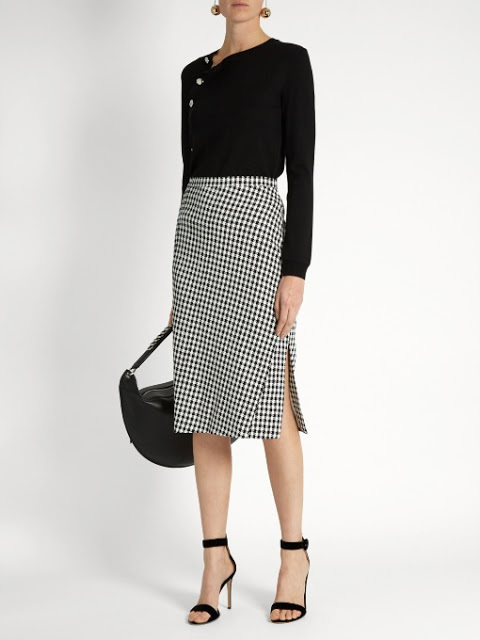 Although the Sportmax skirt is made of a cotton/linen blend while mine is silk, and has softer lines. So. Nothing ventured… and all that… it was time to dive into my closet. I tried my new skirt with a bunch of different tops. And with at least three pairs of shoes and sandals. First up was this black, V-neck sweater from Banana Republic. It’s the right length, and a good weight for the skirt. But it looks a bit bunchy around the middle. Bunching fabric adds bulk. And more middle-age middle is not what we’re going for here, people. Trust me. I tried this combination with my flat Michael Kors sandals and didn’t like the result. Much better with a pump or a pair of black flats. So. Not 100%. But not bad. The best thing is the proportion of top to bottom. I like that. Then, inspired by all those shots of long jackets with long skirts or wide-leg pants that I found while doing my research, I tried this combination. My black Helmut Lang blazer. Still a heavy hitter in my summer wardrobe, despite two years of repeated wearings. Thanks to Liz for pulling this rabbit out of the hat when I was all set to buy a white Theory jacket instead. I pulled on a long-sleeved black tee shirt under the jacket. And my Stan Smith Adidas to keep the outfit from looking too serious. I’m really warming to this look. A good spring run-around-town outfit. I like the idea of a structured, masculine top with a flow-y, feminine bottom. And again, I like the proportions here. The jacket is soft enough in its lines to not look too, too 80s. And I’d keep the jewellry to a bare minimum. This gets a thumbs up. But what about when the weather gets warmer? This skirt will be cool on hot summer days. Especially since it’s only partially lined. 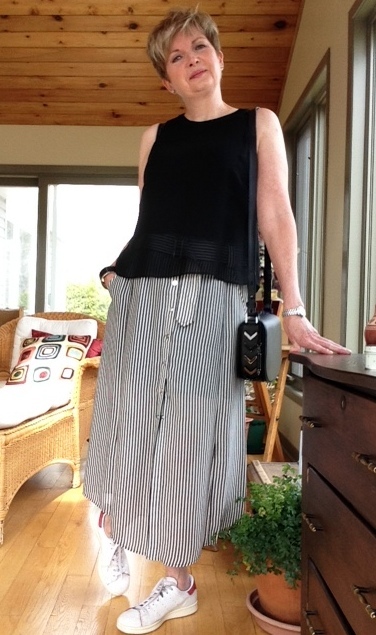 I hauled out my summer staple, my black Rag and Bone layered tank from 2015. Unfortunately the tank is really too long for this skirt, and simply looked bulky. But since it is layered, I had an idea… and tucked the long under layer in, and left the short outer layer…well.. out. This is exactly the length and shape of top I need for this skirt. Short, but not showing any skin, and loose. Unlike the short BR sweater which adds bulk, the looseness of the short tank is slimming. 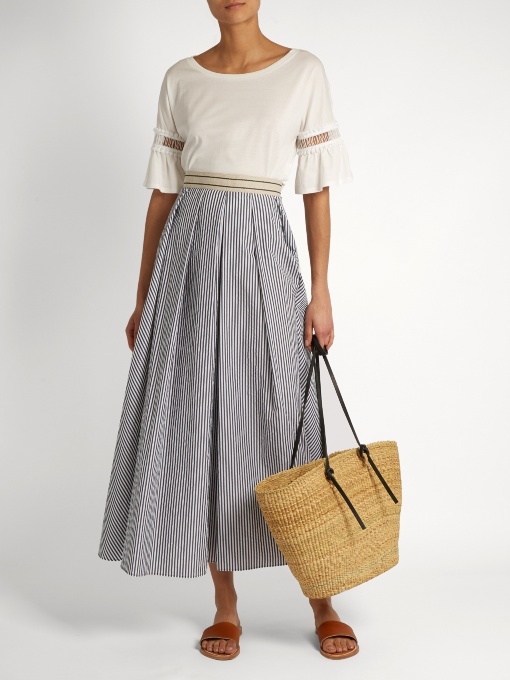 So really what I need for this skirt is a tank or sweater that is the length of the BR sweater or the short layer of my Rag and Bone tank, with the looseness of the R&B tank. Are you still with me? Of course this outfit will probably look better with something other than my sneakers, so try to imagine black flats or black sandals with this. A definite maybe, with a footwear change. Then in the spirit of playing dress-up. And influenced a bit too much by some of the… ah… edgier fashion posts in my Bloglovin’ feed. I tried this. Socks with my loafers. I know I said that I wanted to get out of my rut. Be more adventurous. Step outside my comfort zone. But socks with a skirt? Oh, dear. No, no, no. Nope. I’m laughing and cringing at the same time. Ah…. not on your life. I think I must have been suffering from too many wardrobe changes in too short a time. It made me a bit dizzy. Not able to think straight. And you know, I did feel a bit flushed. It was time to decamp to the sofa with a cup of tea and a good book. You know, I’m always hesitant to adopt major changes in fashion when they first come down the tubes. I’m wary of trends. I want to know about them, but rarely purchase a new trend right away. Partly because if it is just a trend it will go away as fast as it arrived. And partly because it takes the eye a while to adjust. To see the new length or shape as fresh and chic, instead of just strange. So what have I achieved here? I tried on a lot of outfits. More than I’m showing you here. And I think I’m really warming to the idea of a longer, fuller skirt. To a different proportion than I’ve been wearing for the past few years. I’m not abandoning my slim pants, or my cropped skinny jeans, just yet. My Veronica Beard suit from last year will factor largely into my wardrobe this year. My short Rag and Bone dress will still be one of my favourite outfits. But I do think that I’m ready to expand my options. Ready to move on a bit. Style wise. What about you folks. Any new shapes or styles that you’re trying on for size this year? PrevPrevious storyPeru. We Love You. I like the sneakers look very much. I bought a full skirt last spring and didn't get around to wearing it. Because I didn't know quite how so thank you. I'll try sneakers. I imagine birkies in the summer.Definitely flats. Thanks, Anna. I tried my flat sandals , but found that this skirt needs something a bit weightier in a shoe or sandal. Maybe wedges? I can't do Birkenstocks… they simply do not fit my foot. Thanks, Dottoressa. The socks are too funny, aren't they?! Firstly, Susan, I have to say this – you have fantastic bare-bones for any outfit. Slim body, incredible long legs and, in everyone's view but yours, a super nippy waist! For the record, your body is everything mine is not, so please celebrate (and flaunt!) it. The skirt is similar to something I've liked from River Island and I can see from your trying-on session that you will get so many looks and so much wear from it. I like all the tops combos you've come up with, you're so much more stylish than me, so thanks for the ideas and for sharing your try-on girls world session with us, great to hear your thought process too. The bobby-socks look, hmmnn – let's just remember we saw that 50s revival trend first here on this blog!!! It's funny how some looks look right on us and some are …just wrong. For me it's those wide-leg pants or trousers. There isn't much that I can think of that looks worse on me. Just …well…wrong. 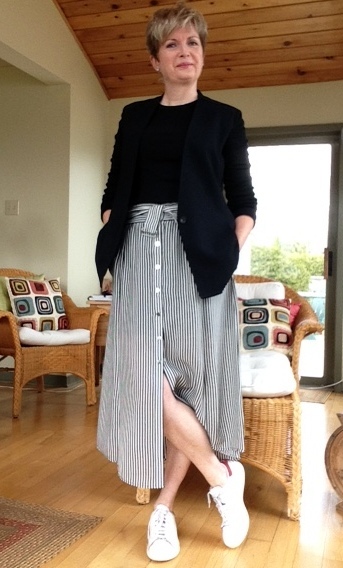 I wear this length of skirt a lot in the summer when it is too hot for jeans or even light pants- it's cooler. I wear them with fairly close-fitting tops that end at the waist, or barely below it like your sleeveless top, not to the hip. And sandals. (Like your matchesfashion shot.) A blazer looks too heavy and long. But, the look on your face says it all, you do not look entirely comfortable in it. The clothes you already own do not look out of date, but I well know that feeling of wanting a lift, something new. However, changing tacks often demands buying all sorts of other things- shoes, tops. Changing tack can be …expensive, I know. But if I'm to get away from the flat sandal, skinny jean look… and into the longer skirt thing… I need to invest in a few tops and a new pair of flats. Maybe just a wider strapped sandal like the photo on the left. It gives it a more substantial look without being heavy. In one of your accent colours? That would be a great option, Lizette. Except I can't wear those style of sandals. They just do not fit my really narrow feet. So I'm thinking of maybe a flat with an ankle strap or some ties to give that more "substantial look." Aagghh. That odd shirt and skirt combo in the second photo is fine if you are planning on being a postulant. I'd have another cup of tea. That's it exactly… the postulant look. Ha. Well spotted! This is a skirt length that is easily unflattering . Not for you with your height , build & legs but it is for me , so I'll be giving it a miss . I know what you mean. We need to be judicious about trends. Ergo the wide leg trouser on me. Ickkk. Thanks, Ali. I don't wear skirts and dresses enough, either. Hopefully this new addition to my closet will change that a bit. Very pretty! Nice step outside of your style box, but you still stayed true to you. Chic! What about crisp white shirt, tucked in and bloused back out a bit in back? Or, bolero length denim jacket? I'm excited about the new full skirts, but fighting the midsection thing, as well. I did try my white cotton shirt tied at the waist. I liked it. But couldn't find any shoes in my closet that looked okay with that combination. I think I need a flat or sandal with a bit of bulk. I'm short-waisted too. And tucking is not something I do, either, unless I've a jacket or sweater over the tucked item. For this skirt I think I need to invest in new flats or sandals. Something with a bit more substance than my current flat sandals. My foot is so hard to fit that I can't wear the open-toed booties but I'll be looking in the next few weeks. Shoes are really my nemesis! Oh, thank goodness you weren't serious about the sneakers. This look on a "woman of a certain age" reminds me of my Irish great-grandmother who, in her 90's, would stroll through the house with her hose rolled down to her sneaker tops…an image that would prevent me from ever thinking this was a good thing. Love the skirt with the black flats – sweet & sophisticated. I was serious about trying the sneakers with the skirt. Just not with socks. Sock in shoes with skirts I gave up when I was nine. I totally agree with the sock in shoes! Here's my observation. I love fashion blogs, but there are some trends that I know are going to translate better on a 20 something. 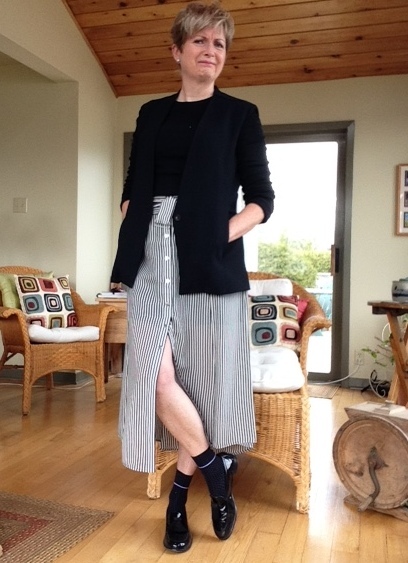 Sneakers with dresses/skirts for example…I think at my age, 62 on the outside, but 26 on the inside, I look like a woman unsure of her balance vs. someone who is trendy. Even on young models I wonder if they're trying to portray "effortless" or "I don't really give a crap, but I'm hip". It's also a case where size matters. Bulky sneakers, like the kind meant for walks/runs from the train to work (with kitten heels in your backpack), look out of proportion. Love your style, honesty and humor. I've been inspired to purchase from some of your posts as we are similar in size and coloring, with the exception that my brown/auburn hair is now silver against my freckles. I do hope you saw that I was not being critical of you, only sharing a pet peeve. It's my Virgo showing. Oh… no worries. I didn't take it as criticism. Except of a trend or a fashion combo you don't like. It's funny how certain images in our heads from the past have an impact on how we see things today. I feel the same about long full skirts with matching blouses tucked into them. When I was a young teacher in the early nineties, it seemed as if all the middle-aged women in my school wore this type of thing. And it emphasized their expanding middle and looked so dowdy to me. What Stacey and Clinton would call "give-up" outfits. "Why not wear a long sweater with the skirt and a pair of snazzy heels?" I thought. So much more chic. But I never talked about clothes in front of these ladies… who affected an air of busy-ness with no time for trivialities like fashion. Funnily enough I felt much the same way when I was the older teacher, and some of the youngins' also looked as if they'd given up. I look back now and think I understand that these women just did not know what to wear. They were busy, and had fallen into a rut, and didn't have time to climb out. Beautiful new skirt Sue! I love the style and that it's silk ..perfect for soaring Ottawa temperatures! I think you've styled it really well especially the partial tuck of your layered top and by wearing flat shoes and sneakers. Also by wearing it partially unbuttoned. Looking forward to seeing what other tops you wear with it …I can sort of envisage an Audrey Hepburn style look! I'm still struggling with skirts but this has encouraged me to "go back to the drawing board!" Thanks, Rosie. I am on the hunt now for a more current pair of flats. I don't often shoe shop. Well, not seriously. I look but I don't often try on. Now I have that Audrey Hepburn image in my head. Full skirt with flats. I'm going to go look up what movie that is. It's Funny Face, with Fred Astaire! Have you thought of a crisp white blouse tied at the front? The knot nip at the waist will keep you looking trim. You could wear runners with it or dressier shoes too. Just thought I'd throw that out there to confuse you even more. Hahaha. But you are obviously doing a stellar job on your own. Thanks for sharing your experimentation. That's a gorgeous skirt to work with. And yes, I understand what you say about cavernous potholes. I did try my white shirt with the skirt… tied at the front too…just like you said. It's just that the shots were terrible so I didn't use them. Great fashion minds think alike, eh? Hahaha – you said it! Though it took me awhile to adjust to skinny pants, once I got used to wearing them I could hardly imagine wearing wider legs again. I recently resurrected an older pair though and discovered that I still enjoyed wearing them. Your post has also inspired me to pull out a summer skirt that hasn't been worn for a few years, but not until our weather here in Alberta warms up. We're snowed under again! Oh, no! I can't believe you're snowed in again. But now that I think about it I remember flying out to Calgary for my brother's May wedding in the late eighties, and it snowed. The airport was shut down and I had to call Hubby to say that I might not be able to fly out when planned. And we might have to postpone our May 24 weekend canoe trip. These were the days before the 24 weather channel..and he thought I was joking. I am thinking about the transition you have just made coming back to Canada from South America. We have so much available to us in Canada and you have travelled to places where people have so little. It's a a difficult transition. I am also wondering if you saw lots of South American women wearing skirts and if that had an effect on you. Love your striped, silk choice. Maybe one of those wrap-style white shirts would be good. The look needs a waist I think. It may have done, LIzette. I know I loved all the colourful full skirts the women wore in Peru. A wrap sweater or blouse would be good, I think. I do not have a waist…so something to give the illusion of a waist instead. Pinning to my Style board! I like the loose tank top look on you. But how about a cobalt blue or aqua? That might give you a lift! Thanks, Lisa. Cobalt blue might be nice. Thanks, Patti. I'm coming around to this look again. Haven't worn it since the nineties. Already told you on IG how well I think you nailed this! As for me, I tried something new yesterday with a below-the-knee white skirt paired with my new off-white, leopard-print sweatshirt. And got a thumbs-up from my daughters, who can be honest and critical. Might post a pic later. . . . never, never will I go back to the socks and loafers of my high school uniform, though. I mean, I know we're Never supposed to say Never. But. . . . Never!! Thanks, Frances. Daughters are good for that, I'm told. Sisters too, in my case. Good for you for pushing your style boundaries and trying new things! I have to admit I tend to stick to my typical work wear style for the most part. I really like how the second look with the longer vest came together. I know it is a take on a modern trend, but it is vaguely reminiscent of Annie Hall, too. Thanks for linking up with Fabulous Friday, Susan. Thanks for linking up to Top of the World Style. You look awesome in this skirt!